Silicone Reservoir Hose Upgrade Kit for Ford F150 - Ford used a hose that clips onto the coolant reservoir on 2011-16 F150 with the 5.0L V8 and 3.5L EcoBoost engines. Our complete upgrade kit includes everything you need to replace that leak-prone hose with a high-quality silicone hose and hose clamps. This is a permanent fix that is much less expensive than OEM parts. Choose a kit with Black (shown), Blue, or Red hose. Castrol SRF Brake Fluid - THE racing brake fluid. SRF can make the critical difference when using metallic brake pads with high thermal conductivity. Resistance to foaming makes it an excellent choice for use with ABS braking systems. Packaged in easy-pour 1 liter plastic bottles. Rated DOT 4 (compatible with all DOT 3, DOT 4, and DOT 5.1 fluids). Dry Boiling Point: 590F, Wet Boiling Point: 518F. Free Shipping* on AiM Linear Travel Sensors - These potentiometers can measure any linear motion including shock and suspension travel, ride height, steering rack position, even wing or spoiler deflection at speed. Easy connection to AiM data loggers. Lengths from 50mm (2 inch) to 200mm (7.9 inch) travel available. 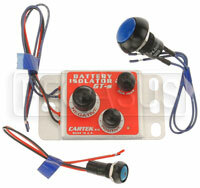 Free Shipping* on the Cartek GT Battery Isolator Kit - This solid-state master kill switch can be triggered by remote push button switches. Eliminates several feet of heavy battery cables. Simultaneously interrupts the battery ground and cuts power to the ignition. Designed and built in the UK to meet FIA standards. Master Battery Cutoff Switch with Alternator Protection - Our top-quality master battery cutoff switch has two extra sets of contacts: One set disconnects the ignition to stop the engine, and the other set safely dumps the output of the alternator through the furnished heavy-duty resistor. Inertia-Activated Fuel Pump Safety Switch - Reduces the risk of fueling post-crash fires by cutting power to your electric fuel pump after an impact of approximately 11 G's. Similar to the OEM safety switches found on many production cars. This universal kit is easy to install on just about any car with an electric fuel pump. The simple push-button reset lets you get back up and running right away. Staubli Quick-Connect Clean-Break Fittings - We stock an extensive selection of Staubli Clean-Break fittings including the SPH Series for brake and clutch applications, the SPT Series for fuel lines, and the economical RMI Series which can be used for fuel, oil or coolant. Free Shipping* on the FireCharger 2.3L AFFF Field-Refillable Fire Suppression System - The best value in fire suppression! The revolutionary FireCharger can be filled and refilled at the track, with no special tools or training! This makes the FireCharger a favorite for track day cars and low-buck racing series where FIA or SFI certification is not required. Free Shipping* on our Low Restriction Exhaust Collectors - These superbly hand-crafted mild steel collectors bring the primary tubes together to terminate in a central point, rather than just chopping the tubes off inside. This reduces turbulence and drag created by the exhaust gases trying to fill the void inside. Dyno and race proven. Sizes for FF1600 and F2000. 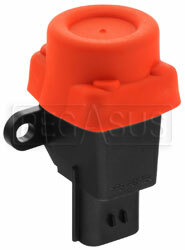 Dzus 1500 Sliding Latch with Bushing - This compact quick-release fastener requires no tools to open or fasten. Measures less than 3/4 x 2 inch and requires just 5/8 inch of clearance at one end to open. Great for interior panels where aerodynamics is not a concern. 5000 lb. Recessed Mount D-Ring - These low-profile D-rings are rated at 5,000 pounds, matching or exceeding the working load rating of most tie downs. The recessed mount requires a cutout in the trailer floor, but it presents almost no obstruction when the ring is folded down. Maximum depth of the recess is 1 inch. Adjustable Toggle Latch with Strike Plate - These versatile draw latches have a threaded hook to provide a simple means to control tension. A secondary lock prevents accidental opening, yet they can be opened quickly without any tools. 350 pound working strength. 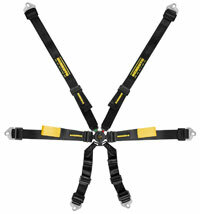 Free Shipping* on the Schroth 2x2 Enduro FIA Harness - This sedan harness is homologated to the tough new FIA 8853/2016 standard. The adjusters on the 2 inch shoulder belts (FHR only) and 2 inch pull-up lap belts have pull tabs for easy loosening during driver changes. Heavy-duty Slide-type Captive Hood Pins (pair) - You won't have to worry about losing any parts since the clevis pins are attached to stainless steel retainer plates. They are also much easier to fasten in a hurry than conventional loose pins. 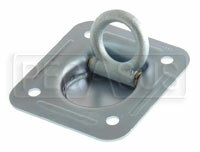 The super-strong steel hood pins are 7/16 inch diameter, 4.5 inches long. 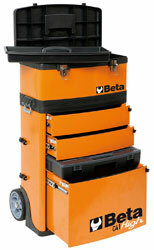 Free Shipping* on the Beta Tools C41H Two Module Tool Trolley - Holds a lot of tools in a compact, mobile package. It's really 3 toolboxes in one! All drawers are secured via a single lock. Each drawer is held firmly shut until its release button is pushed. Makes an excellent grid cart! Wiring our Master Battery Cut-Off Switch with Alternator Protection can be a little intimidating, even for a seasoned pro. Whether you are a visual learner or if words are your thing, our instruction page has photos, wiring diagrams, and a lot of textplanations to help minimize any confusion.